I didn’t think it was possible to make such a magical quiche. This is pretty much the ultimate greasy breakfast food. I can feel my arteries clogging while eating and I am loving every minute of it! It also just happens to be gluten free and has the ability to be dairy free if needed. Extra bonus points! I was inspired by a picture I found on trendypics.net but the instructions to go with it were very vague, so I improvised. Heat the olive oil in a small frying pan over medium heat. Dice the onion and mushrooms and sauté in frying pan. Add the eggs, cheese, cooked mushroom mixture and salt and pepper into a mixing bowl and whisk. 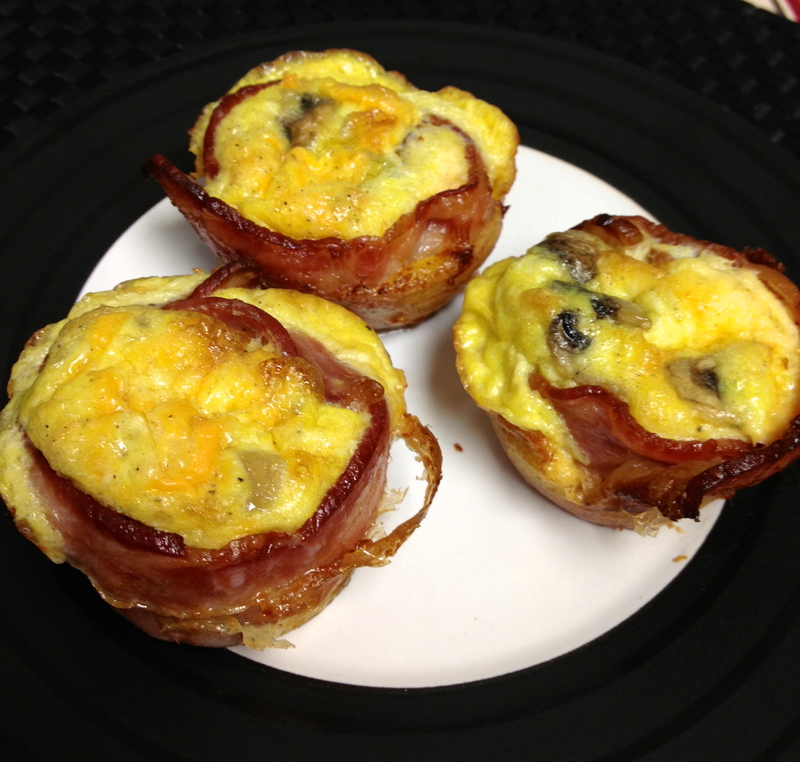 Take a mini muffin tin and wrap one strip of bacon around the edge of each mould. Pour the egg mixture into the centre of the bacon until moulds are 3/4 full. Bake in preheated oven for 15 minutes or until eggs are golden brown. Be amazed at how easily the bacon quiches pop out of the muffin tin and bask in the greasy glory of your new favourite breakfast food.